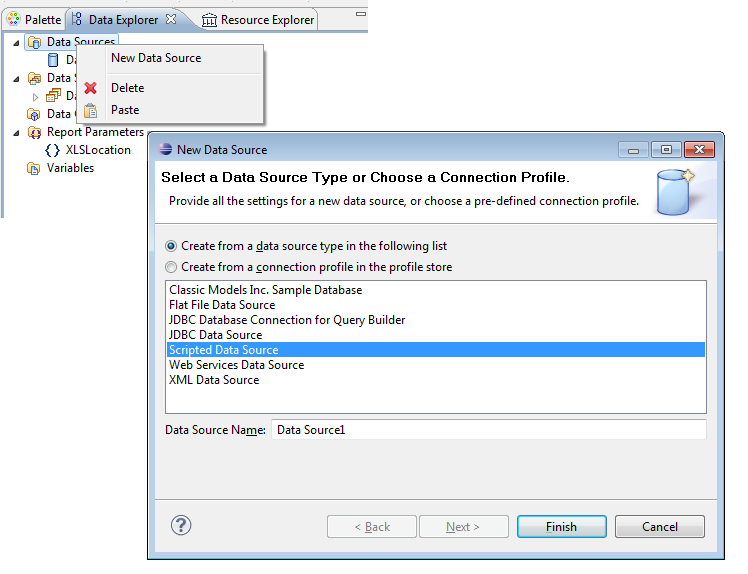 BIRT currently supports many data sources, including XML, Web Services, JDBC and flat files. This list can also be extended by implementing BIRT extension points. Using this method is called implementing an ODA(Open Data Access) extension. 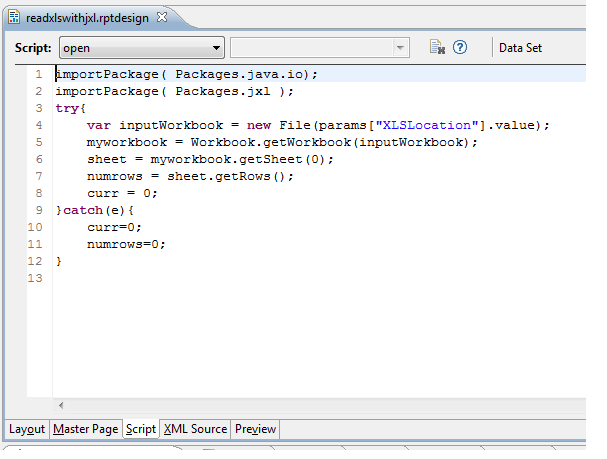 First download the Java Excel API and extract the jxl.jar file from the download. You can add this Jar to your BIRT project in several different ways. 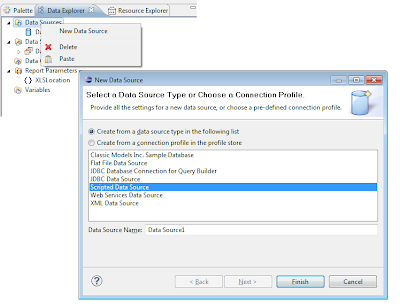 See this post for designer classpath options. One simple way to add the jar is to put the jar in your BIRT Project Resource folder and then add a reference to it in the report design. 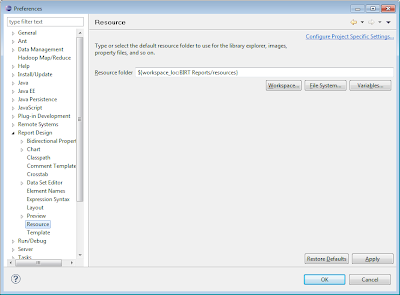 You can set the resource folder in the BIRT Designer Preferences (Window-Preferences-Report Design-Resource). 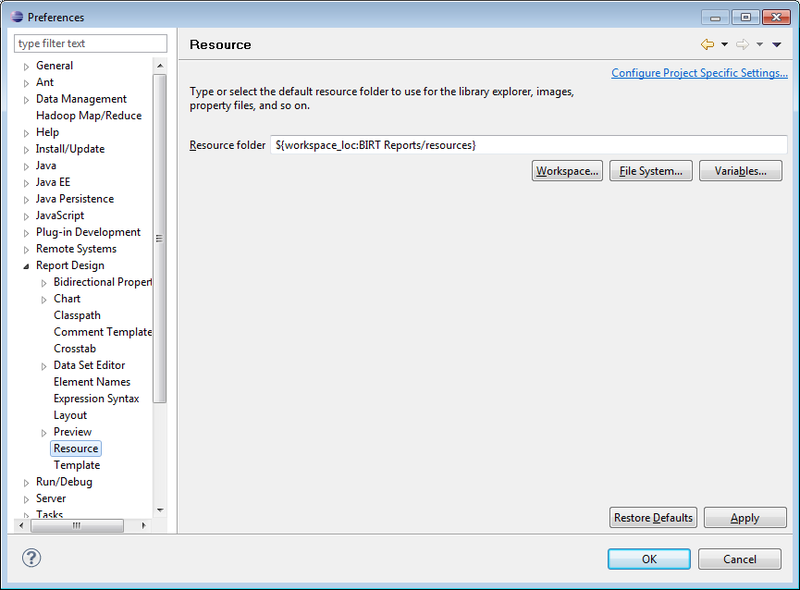 The resource folder is also a web.xml setting in the deployed viewer. In the above screen shot we have a resources folder under the BIRT reports project. Just import the jxl.jar into this folder. 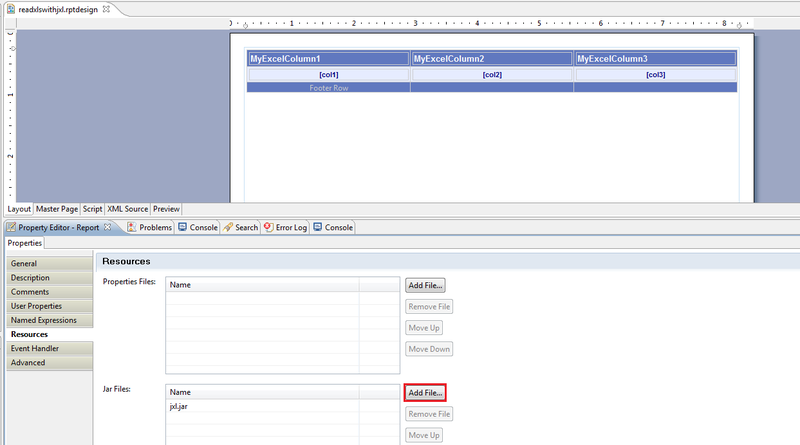 To create the reference to the jar in a report design, select the properties view for the report and click on resources. Click the add file button in the jar files section of the report resources and add the jar. The jar file should now be accessible in the designer from script or expressions. When you deploy the report to the Viewer make sure to copy the jar to the resource folder of the deployed Viewer. If this method of adding the jar is not desirable you can always create a folder in the project containing the lib and add the jar to the project classpath entry (Window-Preferences-Report Design-Classpath). This will allow the jar to be accessed at design time. 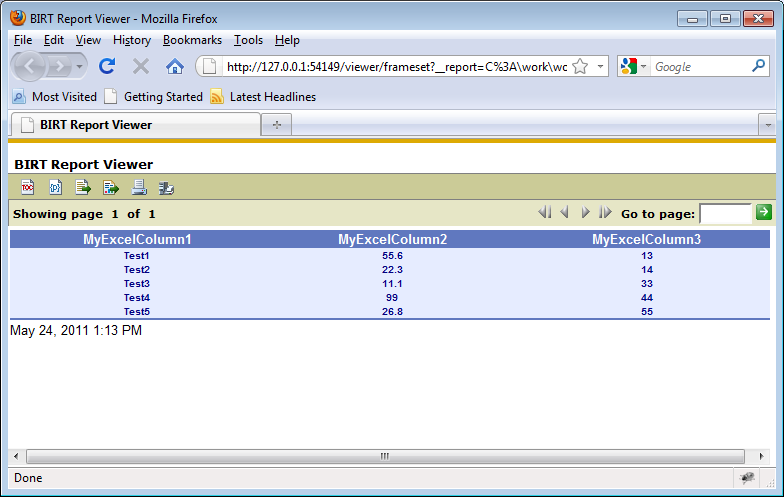 When deploying the report you can then just copy the jar to the WEB-ONF/lib folder of the deployed viewer. 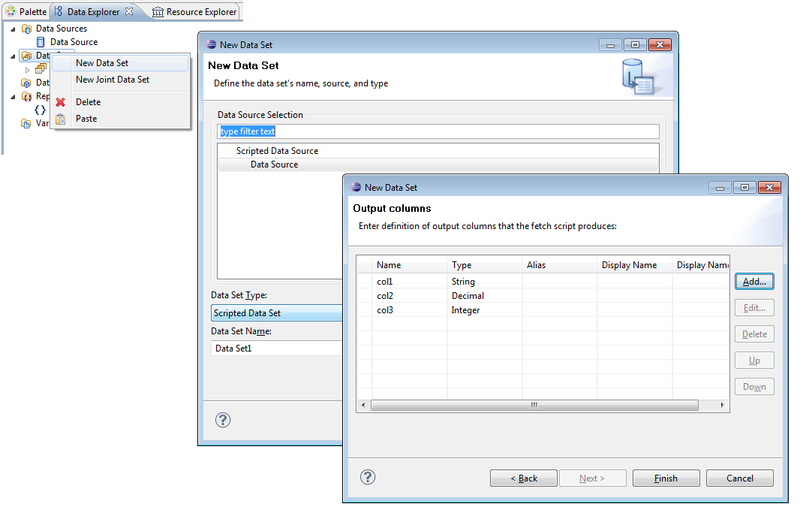 Use the new data source wizard to add a scripted data source and use the new data set wizard to add a new scripted data set. 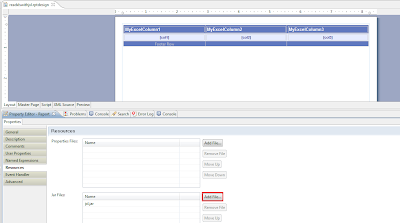 In this example we are reading a three column xls file, so we define 3 columns in our dataset. 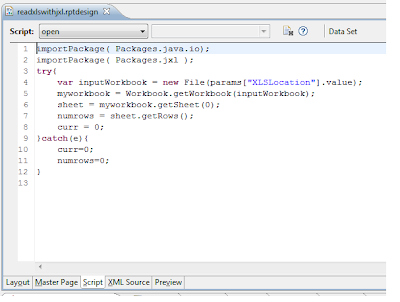 The final portion of this example requires that we add code to the script events to call the Java Excel API. 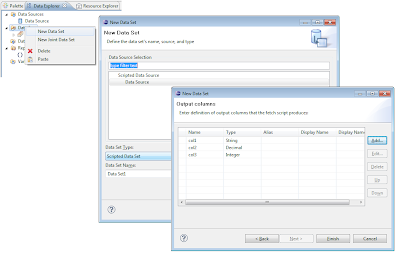 Select the new data set and click on the script tab. From the drop down menu select the open event. Enter the following code. 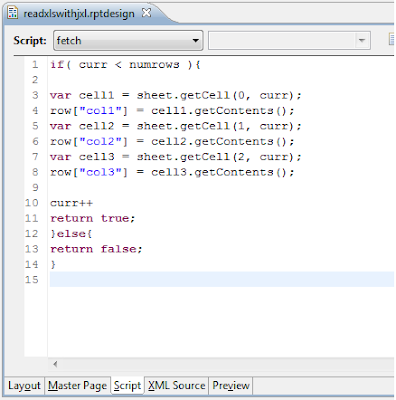 Select the drop down menu and select the fetch event and enter the following code. The fetch event is fired once per row of data and stops processing when the event returns false. 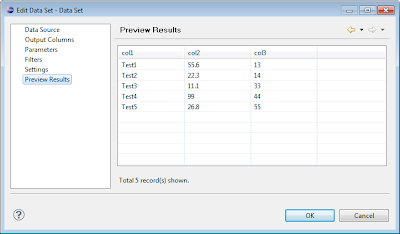 In this code we are just retrieving the first three columns of the xls sheet and assigning them to the dataset row columns. The final event to implement is the close event. Select close from the drop down box and enter the following code. 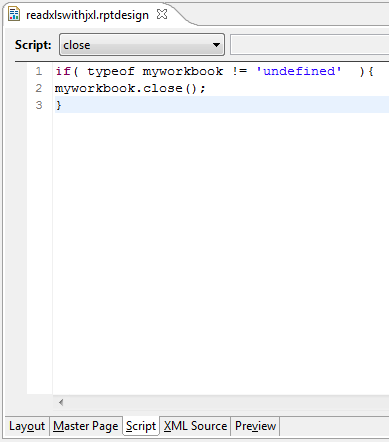 This code closes the workbook. 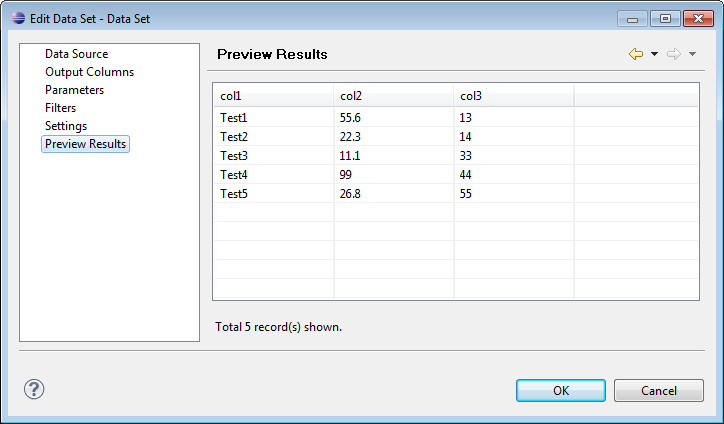 You should now be able to preview the dataset. 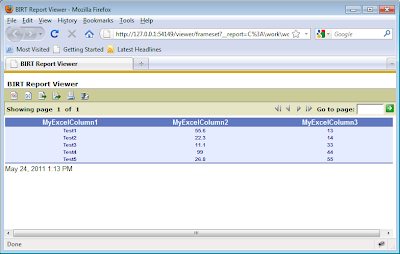 Remember to add the parameter that defines the location of the xls file. Once the dataset is complete you can construct your BIRT report as usual. This attached example produces the following report.